Hello! it is such a blessing to serve our Lord as Financial Secretary of Rock Creek Baptist Church. I am a relatively new Christian and working with such godly people continues to help me grow in my walk with the Lord. I was born and raised in Escondido, California and graduated high school in 1965. After a summer of working in the alfalfa fields, I made the decision to join the Navy. Twenty-eight years later, I retired from the Navy as a Senior Chief Radioman. As soon as I realized I wasn't ready for retirement, I went back into the workforce at a San Diego area Native American casino and eighteen years later, in 2014, I retired from my Senior Operations Training Specialist position there. At last I was ready for retirement...or at least I thought so - more on that later. 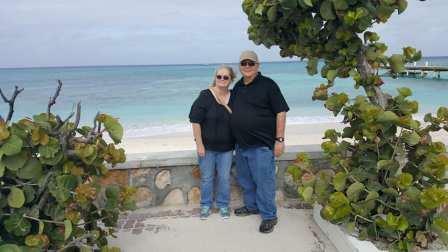 My wife, Lynette, and I were married in 2011. Between us, we have four sons (Kurt, Greg, Stephen, and David), a daughter (Marcie), three grandchildren (Vanessa, Amanda and Brad) and one great-grandchild (Scarlett). My wife is from the Shawnee area, so when I retired, we relocated here to be closer to our children who all live in either Oklahoma, Illinois, or New York. My wife and I began coming to RCBC in 2014 and joined the church the following year. In late 2016, the Financial Secretary position came open and after much thought and prayer, I applied for the position...so much for retirement. I spent most of my life in denial of the Lord and was a hateful, greedy, selfish, dark person. in 2007, Lynette talked me into going to church with her. I still have an indelible image of that church etched into my brain. It was a little church in Lakeside, California with about eighty God loving members. I enjoyed going to church with Lynette, enjoyed the singing and the Pastor's messages. But I returned to my old ways on Monday through Saturday each week. I then joined a Thursday night Bible study and loved it. So, I had found a diversion from my sinful side of life on Sundays and Thursdays but still just didn't get it. Then one Sunday in September 2009 I was sitting in my back row seat at church listening to the sermon when an overwhelming feeling came over me. Church was just getting over and the pastor sat down beside me and asked if I was okay. I told him I thought something might be wrong with me because I was feeling tremendous emotions. He smiled at me and asked if it might be that I was really ready to accept the Lord full time in my life. Immediately I felt joy that I had never felt and literally felt all the darkness being ripped from my chest. It was a physical and psychological experience that I could have never imagined. By the grace of God, I was given a new life to live for Him. To this day, I thank my now wife for guiding me to church and Pastor Al for investing so much time in me but, most of all, I thank the Lord for His sacrifice, for His forgiveness and for being my Savior.